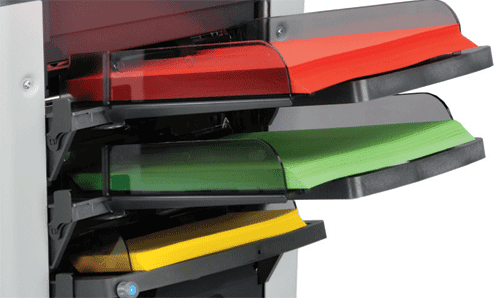 The Formax 6210 Series of folder inserters combines the reliability they users know and love with advance folding and inserting technology and flexible user-friendly features. With a 7″ full-color touchscreen setup and job customization is easier than ever! More productive with its high-capacity vertical stacker and top load envelope hoper. 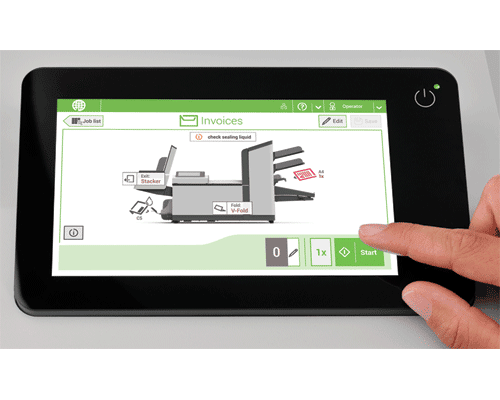 With the automatic paper and envelope presence sensors, it will show you on the touchscreen why your job has stopped and where to add more product. When you’re not using the 6210 Series it goes into standby mode to save electricity. Setting up a new job is fast and simple with AutoSetTM! With AutoSetTM the 6210 series will automatically set the paper and envelope size then determine the proper fold points for the job. You can then save that job in memory to use again later. Program and store up to 50 jobs and set up in seconds. 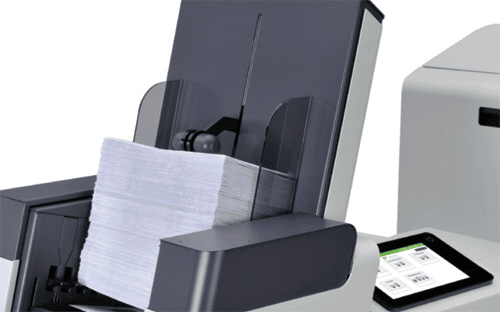 With the optional CIS scanning technology, it can read OMR, 1D and 2D barcodes printed anywhere on the document. You may be wondering, how this is useful. It’s actually simple, yet genius. Let’s say you have a job where some recipients get 1 sheet, some get 2 from bin 1, 1 from bin 2 and 1 from bin 3, and some get 3 from bin 1. The barcode tells the printer what to insert. You simply program the machine to let it know when it sees a certain barcode, what pages it should insert. FD 6210-Special 2 with two sheets feeders and a special insert/BRE feeder. The 6210 Series offers the power and reliability of larger machines with the ease of operation required for the office environment. Options for the Formax 6210 Folder Inserter include a production feeder for up to 325 BREs or 1,200 inserts up to 6” in length, productivity package for increased throughput up to 20,000 pieces per month, CIS Scanner, advanced OMR and BCR, short feed trays and a front or rear side exit tray. Cascade Mode: Maximizes output by connecting multiple feeders with the same document. When one feeder empties, the next automatically starts feeding, for a total hopper capacity of up to 650 sheets.